SarsUp is a technology startup located in Sisian, specialized in CNC machine engineering and production. The startup team consists of 4 people. “In 2015 me and my friend Hayk decided that it is time to move back to Sisian. Then we started to ask ourselves a question – what is the reason that young people do not go back to the regions after coming to study in Yerevan. The reason mainly is lack of jobs. 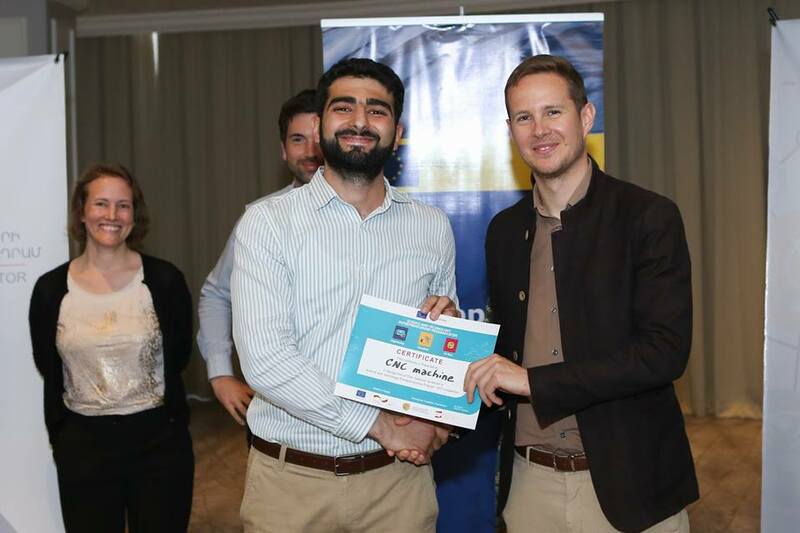 Since Sisian high schools have always been known for good mathematics we decided that Engineering and Programming startup would work best in Sisian,” tells Hayk Yeranosyan, the co-founder of SarsUp. According to him, there has also been a precedent in Goris that inspired the team. “Namely, Artur Khojabaghyan left his job at Synopsis and moved back to Goris founding two technology companies (Instigate Mobile and later his own AugmentAr cjsc) with about 50 employees. Consulting with Artur we approached Vahagn Poghosyan from Instigate Group and started basic programming and engineering training in Sisian. The training was very basic so we could include as many people as possible. We started with 40 participants – thinking that success is very close. But the difficulties were only starting,” he tells. Hayk notes that they had very promising students, however their parents had other plans for them (like becoming an economist or lawyer). “Since many had no idea what a programming job is, it was very hard for us to keep our students engaged in the long run. For example, the only programmer in Sisian, Armen Badalyan, is 50 years old and is known to be a weird guy, with a nickname “Brain”. So we had to crash many stereotypes and it was not easy. By the end of the training we were left with 6 people”. The team started with doing basic landing pages, being based in one of Sisian high school classrooms. Later they rented their first office space – an old apartment in the Sisian city center. After some time the co-founders started to notice that engineering is more interesting for their students than programming. So the idea about CNC machines came about. “We started to build a school lab CNC with our team. This was our first prototype. My friend Andranik, who has a PhD in engineering, has helped our team with coaching and lots of technical advice. Armen, our Senior engineer has also become a coach at Armath engineering labs and developed some of the prototype features based on his experience working with school children. Our prototype is more user friendly and easier to assemble,” Hayk Yeranosyan states. The startup with its CNC Machine Line solution has received grant from STEP program in 2017. “In a cold office, while working on our CNC prototype we saw the announcement of STEP program and thought – this is our chance. Our team won the STEP grant in May 2017. We had a plan to start the business in June 2017”. With the grant money the startup was able to buy a laser CNC machine and an industrial CNC machine to put together a machine line of producing educational and industrial CNC machines. They moved their office and factory to Sisian’s former agro-equipment factory that was abandoned after the Soviet Union. “Since we are the first and only engineering startup in Sisian we hope to revive this place and turn it into technology center in the longer run”. According to Hayk, the startup’s educational CNCs have the potential to be introduced to the EU market. “We can supply private engineering labs to EU or sell the machines in retail market. We believe that if our product is successful in Armenian market, it will be also competitive in Europe”. In 2019 the startup is planning to expand the production and further develop its first model.